Darren Kellerman Installed as Grand Master of the Most Worshipful Grand Lodge of A.F. & A.M. On March 21, 2015. Grand Master Kellerman would like to invite you to his Reception and Banquet on April 4th 2015. The reception will take place at the Topeka Masonic Center located at 2300 SW 30th st (30th and MacVicar) Topeka KS. The reception will be from 4:30 pm to 6:00 pm. The banquet will start at 6:00 pm, seating is limited so please make your reservations early. Please click the invitation on the right to register for the banquet. Online registration for the 159th Annual Communication of the Grand Lodge of Kansas is now open, please click here to register. Registration information and motel accommodations can be found and made through the online registration form. If you have any questions or concerns, please contact our office, Monday through Friday, at 785-234-5518. If you are a newly raised Kansas Master Mason and you have received a voucher for your registration fee for the Annual Communication, please call our office for the promo code to enter when registering online. Likewise, if your Lady wants to go on the Ladies tour, please contact Mary Halleran at “mary@kansasmason.org” to reserve your seat. The number is limited and reservations for it is on a first come first serve basis. The 2014 Leadership Academy will again be held at the Topeka Capitol Plaza Hotel near Downtown Topeka. We are looking for an even larger attendance than last year, so don’t wait to register. You can easily register by clicking here. For motel accommodations, the Capitol Plaza Hotel has given us another great deal with some very affordable rates in a nice place to stay. – Instructions for booking on the Capitol Plaza Website or calling the hotel directly (*please note two different codes depending on how the reservation is booked): Reservations can be made online at www.capitolplazahoteltopeka.com Click on “Reservations” and you will be redirected to reservations page. Select “Groups” to continue booking. The attendee code for the discounted rate is LEADERSHIP, once the code is entered, you will be able to select the dates and book your reservation. OR, call the hotel directly at (800) 579-7937 (please mention you are part of Grand Lodge of KS: Leadership Meeting or group code LODGE). Did you miss the inaugural course in April ? We are offering it again on September 6, in SIX locations. Wyandotte, Clay Center, Pittsburg, Dodge City, Goodland, Sterling. $25 gets you the course book and access to the complete course. Click here to register now, the deadline is August 30. Registration for the Grand Masters Chance to Advance has closed. To schedule an Event involving the Grand Lodge officers, use the Event Planning Guide below and then email pertinent details to events@kansasmason.org . Your event will appear on the Calendar. If you have not provided enough detail, the event will be marked as TENTATIVE until details are complete. To post dates for social events at your lodge (excluding stated/special communications and/or degree work) please contact the editor of The Kansas Mason. Only 70 days left until the next Annual Communication. Remember last year? That was a very popular event. Space filled up quickly. Register today!! See the last issue of The Kansas Mason (November 2014) for the registration form. Even better than the 158th! are the words to describe this year’s event that is drawing the Who’s Who of Masons from across the country. 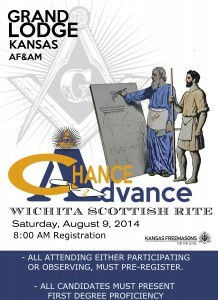 Vendors, Masonic Education, top speakers, Kansas Lodge of Research, appendant bodies representation, and much much more. You won’t want to be left out in the cold. Kansas Lodge of Research’s inaugural Masonic Legends: Lunch n’ Lecture Series registration deadline is quickly approaching. Legendary Mason and well-published author Brother Robert G. Davis 33º G. C. of Guthrie, Oklahoma will be our first guest speaker. 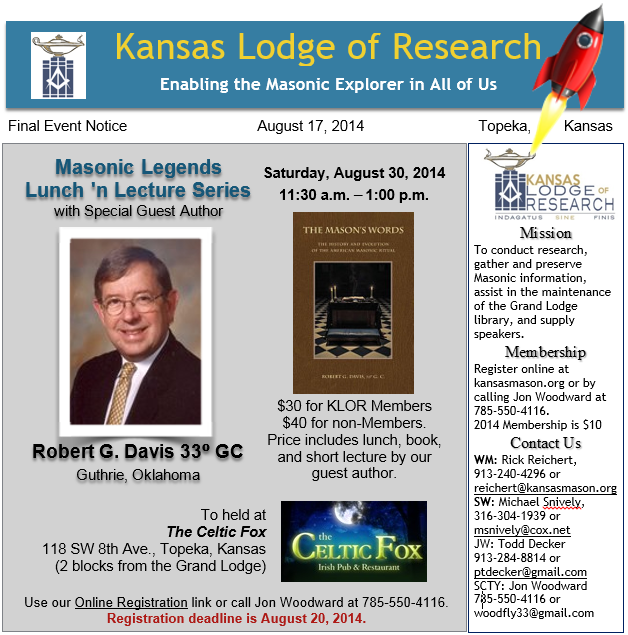 The luncheon will be held on August 30, 2014 starting at 11:30 a.m. at The Celtic Fox in Topeka, just two blocks from the Grand Lodge Building. This event is the same day as the Allied Masonic Degrees and the Mount Zion #266 meeting, both of which are being held in the Grand Lodge building. Registration for lunch is required but can be done online. Please register by Wednesday, August 20th to ensure you have a seat, book and lunch.